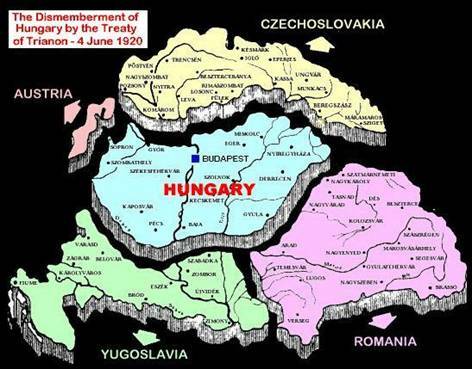 Concluded in 1920 in Versailles (France) as a result of the end of World War I and Hungary’s voluntary withdrawal from it, the Treaty of Trianon left Hungary with only 93,000 km2 of her pre-war territory of 325,111 km2 reduced her population from 20.9 million to 7.6 million. Forced to cede considerable chunks of territory to Romania, Czechoslovakia and Yugoslavia (at that time called Kingdom of Serbs, Croats and Slovenes), plus some smaller areas to Austria and Poland, Hungary had to pay heavy war reparations and keep her armed forces reduced to 35,000 men only. More than 3.3 million ethnic Hungarians (31%) found themselves outside of Hungary forming significant minority groups in the neighbour countries. 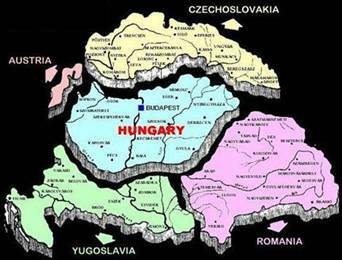 Both ruling elites and the population of Hungary independent of their political orientation did not accept the terms of the Trianon treaty. Its provisions caused numerous conflicts that strained relations between Hungary and her neighbours and finally pushed Hungarians towards alliance with the Third Reich. It would hardly be an exaggeration to say that it is still far from being fully accepted even by modern Hungarian society almost hundred years upon its conclusion. The below texts will give you more detailed analysis of the Treaty of Trianon and its consequences for Eastern Europe. You are also advised to check our virtual “map room” that contains historical maps of Hungary and her neighbour countries.